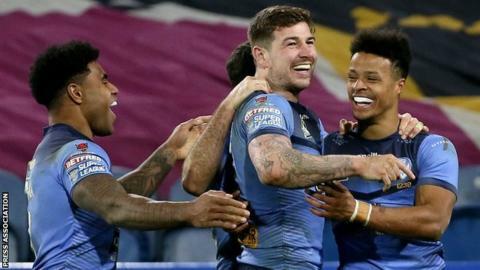 Leaders St Helens scored eight tries as they kept up their 100% winning start to the 2019 Super League season with a heavy win at Castleford. Dominique Peyroux led the way at Wheldon Road with two tries. Lachlan Coote, who also kicked five goals, Regan Grace, Zeb Taia, Louie McCarthy-Scarsbrook, Mark Percival and Jonny Lomax also all crossed. Cas finally got on the board after the break with tries from centre Michael Shenton and winger Jacob Trueman. Shenton got away with what should have been an an offside decision to go over half the length of the field for an interception try against his old club, converted by Jordan Rankin. Daryl Powell's men also scored a second try with the last play of the game. But they were about the only things that went the hosts' way all night against a superb Saints, who have not lost away from home now in almost a year. The victory did not quite match the 12 tries they ran in when they won 72-4 here in 2006 and again when they won 68-22 in 2009. Admittedly, Saints were helped by bad handling errors from Super League's joint-top try-scorer Greg Eden in the build-up to two of their first three tries. The second of them prompted Cas head coach Powell to show his frustration by leaving his lofty perch high up in the stand to storm across the pitch to the dug-out on the opposite side. But, in its own way, on a ground where they clearly enjoy playing, against a Cas side who finished third last season, Saints' latest Wheldon Road romp was just as impressive. "I just thought it was two teams playing at different levels, to be honest. They were outstanding. And we just got rattled. They were just too good for us. "The second half was terrible. No excuses. We just got completely outplayed. It was a really harsh smack around the chops. "They are playing a consistent team selection, they all look in great nick. We have a few guys coming back from injuries and are two games back in. But they aren't excuses. We haven't been playing well." "Obviously I'm really impressed with the boys. They were all fantastic. It's a tough place to come and play but that was probably our best performance of the year. "We knew it had to be. We knew it would be a hard game but I'm really impressed with them. It's hard to single a player out, which is good as a coach. Everyone did their job. "We expect to play well but I didn't expect that result, that's for sure. I know we are improving every week and that's great. I'm seeing it in training and I'm seeing it in games." Castleford: Mata'utia; Minikin, Foster, Shenton, Eden; Trueman, Rankin; Watts, McShane, Millington, Holmes, Moors, Massey. Interchanges: Clare, Milner, Sene-Lefao, Cook. St Helens: Coote; Makinson. Naiqama, Percival, Grace; Lomax, Fages; Walmsley, Roby, Thompson, Taia, Peyroux, Knowles. Interchanges: Paulo, McCarthy-Scarsbrook, Lees, Ashworth.